Trim N Collect will trim and transcode media clips used in your project to include only the used parts, and relink to these files. It's a great solution if you want to transfer or archive your projects. Save your disk space, transfer time and money! Additional options give you total control over the size of handles you want to leave, processing of image and multi-channel EXR sequences, as well as how the files are collected. Automatic folder creation - new! Automatically consolidate overlapping media - new! 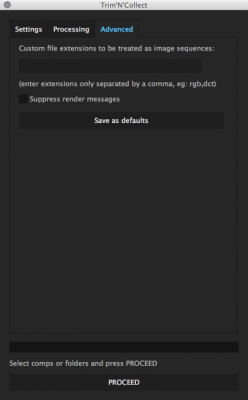 Don't transcode full range media - new! 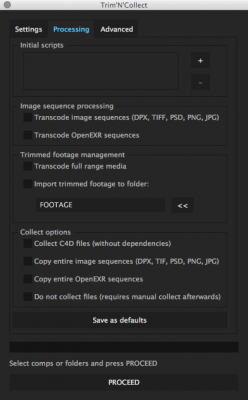 Transcode OpenEXR sequences will transcode the sequences of multichannel exr files using the template presets, depending on them having an alpha channel. Customizable extensions for image sequences - new! Do not collect files will not perform the collect operation at all, instead only trimming and transcoding the used parts of the footage to the destination folder. Conform Studio owners can purchase Trim N Collect for $39. Just make sure you are logged in to the same account that you purchased Conform Studio with. If you have any issues or questions please contact support. Please download the user guide below to review the known limitations. We also encourage you to download and use the trial version linked above before purchase to make sure it works for your workflow. Added: Pulldown warning. The script will terminate upon encountering footage with pulldown. 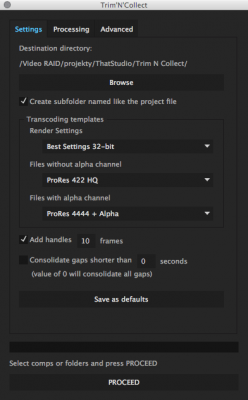 Fixed: Correct render queue behavior for AE versions 13.0 and above. Fixed: Layers with tracking mask would switch places after replacing. Fixed: Same file in different places would prevent the script from rendering. Fixed: Sometimes the script would stop during footage replacement. Added: Layered Adobe Illustrator ai files will generate psd/ai warning and switch to manual collect mode. Fixed: Multiple dots in the filename would trim it to the first dot.